If you’re looking for the best outdoor tanning lotion, you’ve come to the right place. We researched some of the top brands and best-selling products. It was some of the hardest work we’ve ever done, sunning ourselves and sitting around outside. The result of all of our efforts? We put together these outdoor tanning lotion reviews to help you find the right one for you. Before we get to it, let’s look at some important features to consider. 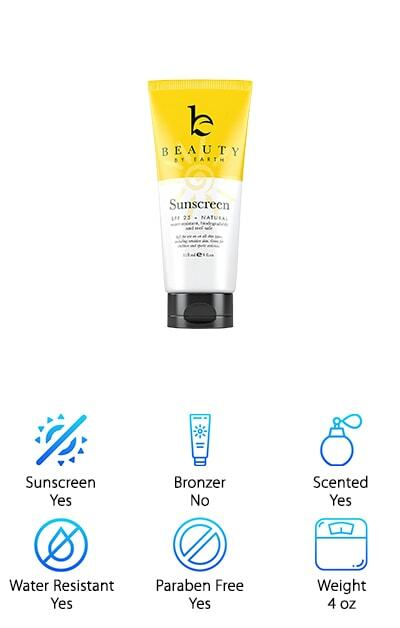 Sunscreen - Some of these products have SPF, some don’t. If you want to give yourself a little protection while you tan or if you’re going to be outside for an extended period of time, choose one with an SPF. Bronzer - A bronzer will make your skin look tanner. Bronzers are basically self-tanners added to the tanning lotion to help you get a deeper looking tan without needed more sun to do it. A handful of our picks have bronzers. Scented - Most of these are scented. They tend to smell like the natural ingredients that are in the formula. A lot of them have a coconut scent. One of our picks is a mineral lotion and does not have a scent. Water Resistant - This is especially important if you’re going to be at the beach or by the pool. Of those that are water resistant, most for up to 80 minutes. That means that they’ll maintain their SPF even after that time. Paraben Free - Parabens are a preservative that were once pretty commonly used in cosmetic products like sunscreen, lotions, and makeup. Some research shows that parabens can lead to estrogen disruption, which in turn can lead to a lot of other problems. Weight - This is the amount of product that you’re getting and it ranges greatly in these products. The smallest amount is 3.4 oz and the most is 13.5 oz. Pay attention to this amount when comparing prices. Now that you’ve read our short tanning lotion buying guide you should have a better idea of what to look for when shopping. So, let’s move onto our reviews. Here’s the deal: the first 2 items are our top and budget picks. If you don’t have a lot of time, start here first to get an idea of the range that’s available. Read through the reviews of all of our picks if you can. They’re all really great! OK, let’s go! 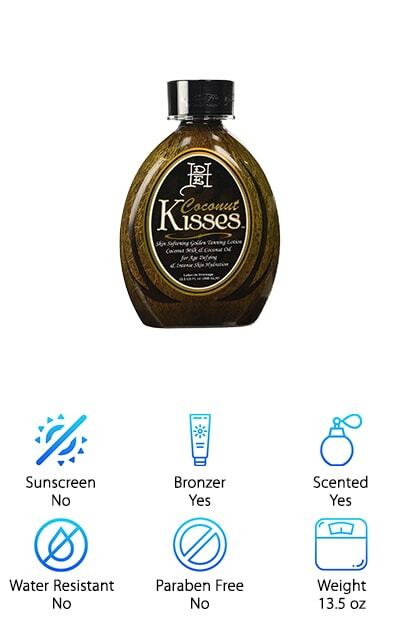 One of the best outdoor tanning lotions we came across in our research is Ed Hardy Coconut Kisses Tanning Lotions. First of all, it just smells delicious because it’s made with coconut milk and coconut oil. The special tan intensifiers also make it the best tan accelerator for outdoor tanning without the addition of any bronzing agents. How does it work? It stimulates and increases the skin’s production of melanin to get you tanner, faster. And get this, it also reduces the appearance of cellulite and helps promote skin firmness. Do you have tattoos? Are you afraid that too much time in the sun will cause them to fade quickly? This is a great choice for you because it prolongs their life and color while still delivering amazing tanning results. 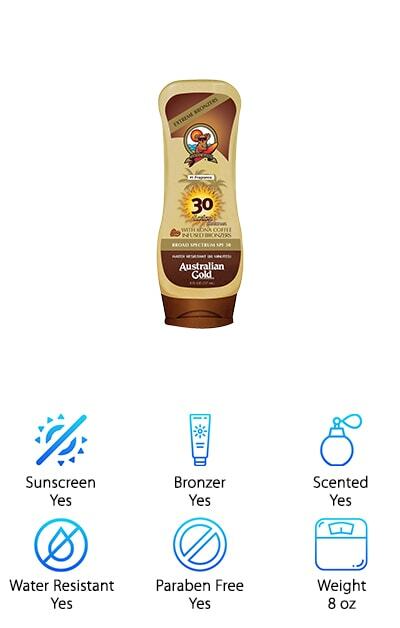 For an outdoor tanning lotion that gives you some protection from the sun and will fit into any budget, check out the Australian Gold SPF 30 Lotion. As you can tell from the name, this one does act as a sunscreen and with an SPF of 30. It offers UVA and UVB protection and also has instant Kona coffee bronzers to give you a nice, summery glow. One of the things that we like about this one is it’s waterproof for up to 80 minutes which makes it a great choice for the beach or pool. You don’t have to worry about constantly reapplying. Australian Gold has been in the sun care business for more than 25 years and have always made their products without animal testing. Plus, they never use any unnecessary chemicals. Beauty by Earth is our pick for best outdoor tanning lotion for fair skin. Why is it so good? For one thing, it’s a mineral sunscreen. Chemical sunscreens work by absorbing into your skin. That’s why you sometimes have to wait a few minutes before going into the water after applying. On the other hand, mineral sunscreens like this one sit on the skin’s surface. They provide an immediate barrier and have fewer chemicals. And get this: it’s environmentally safe. It’s even reef safe and won’t harm marine life so you can swim free in the ocean without worry. Because it’s non-toxic and skips a lot of the harsh chemicals, its safe even for kids or people with sensitive skin. But the powerful zinc oxide keeps even the fairest skin protected in the harsh sunlight. 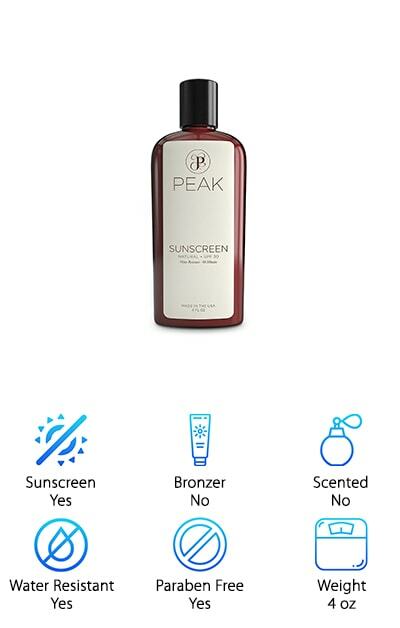 If you’re looking for a good outdoor tanning lotion that has no harmful chemicals and contains natural ingredients, take a look at this mineral sunscreen from Peak Products. It’s one of only a few on the market that completely free of chemicals. Get this: it’s free of parabens, artificial fragrances, phthalates, PABA, oxybenzone, and more. It’s eco-friendly, biodegradable, and most importantly, it works. The SPF 30 mineral based formula isn’t sticky or greasy. It rubs into your skin completely and doesn’t leave any residue behind. One of the things that we really like about it is that it’s waterproof for up to 80 minutes. That means you won’t have to constantly reapply. You can also wear it into the ocean without worrying about harming the environment. Why? It’s completely eco-friendly and won’t affect marine life. 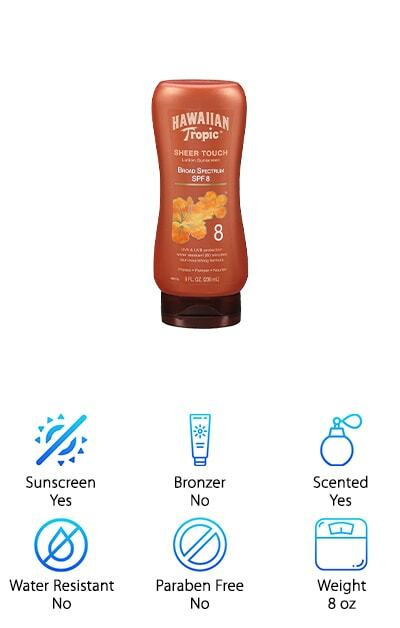 Hawaiian Tropic Tanning Lotion is a good pick for best indoor outdoor tanning lotion. Why? It has just a little bit of sun protection to ward off burns whether you’re out on the beach or laying in a tanning bed. Hawaiian Tropic has been around for a really long time - it was founded in 1969! This formula helps you achieve the perfect bronze while nourishing your skin with antioxidants and the minimal SPF to keep your skin soft and moisturized while you tan. How does it do it? With exotic botanicals and extracts that keep your skin soft and nourished while you’re out in the sun. It’s also water resistant for up to 80 minutes so you don’t have to worry when you take a dip in the pool or wade out into the ocean. 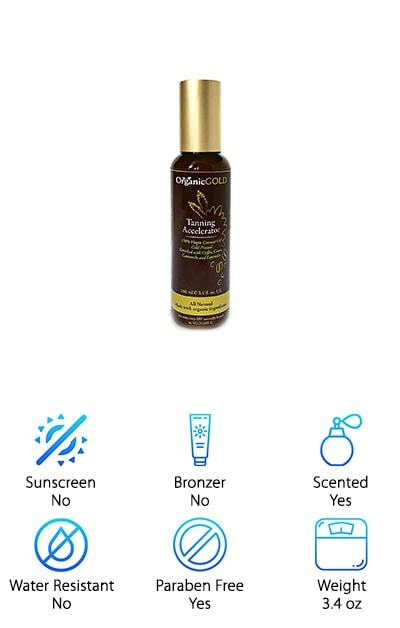 Another tanning lotion outdoor lovers need to see is this Organic Gold Outdoor Tanning Oil. We loved that it’s light and non-greasy. It also gets absorbed by your skin pretty quickly. This is a natural and organic product that’s non-GMO and contains no parabens or petroleum. Not only will you get a deep brown tan but there are plenty of other benefits as well. It contains natural ingredients that are known to be anti-fungal, anti-bacterial, and anti-viral. It contains pure virgin coconut oil that contains a lot of awesome things for your skin, like vitamins E, A, and C. The smell is just divine, too, a sweet mix of coconut oil and natural herbs. It’s actually available in 2 different varieties: coffee, chamomile, lavender, and cacao and olive, grapeseed, sesame oil, and green tea. 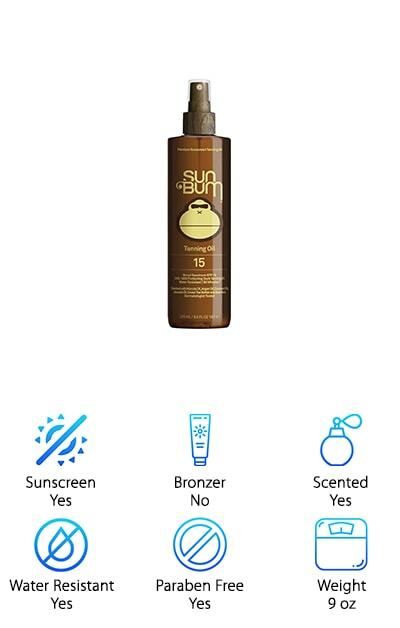 One reason Sun Bum Tanning Oil is the best lotion for tanning is because it protects your skin while also helping you get a deep bronze tan. How? For one thing, it does contain some sunscreen with SPF 15. It’s waterproof and sweat resistant for 80 minutes and provides broad spectrum UVA and UVB protection. And get this: it acts as an accelerator so you can get a great tan without spending too much time in the sun. It contains a lot of natural ingredients: coconut oil, argon oil, avocado oil, aloe vera, green tea butter, and kona coffee plant extract. You can see why this is the best tanning lotion outdoor goers love. It’s also 100% vegan, hypoallergenic, dermatologist tested, and cruelty free. Oh, and one more thing. Made in the USA. What more could you ask for? 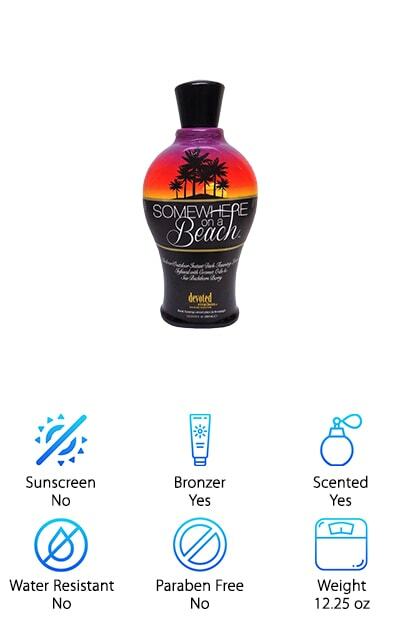 Somewhere on a Beach Tanning Lotion is the perfect name for this best bronzing tanning lotion. This lotion has powerful intensifiers which help you get a better tan in a shorter amount of time, meaning you’ll spend less time in the sun. It also has deep natural bronzers that give you a streak-free tan. There’s more. It even helps you look younger. How? It contains advanced matrixyl synthe 6, an anti-aging peptide that will help reduce fine lines and wrinkles. Plus, there are coconut and walnut oils that hydrate your skin and keep it soft and smooth. 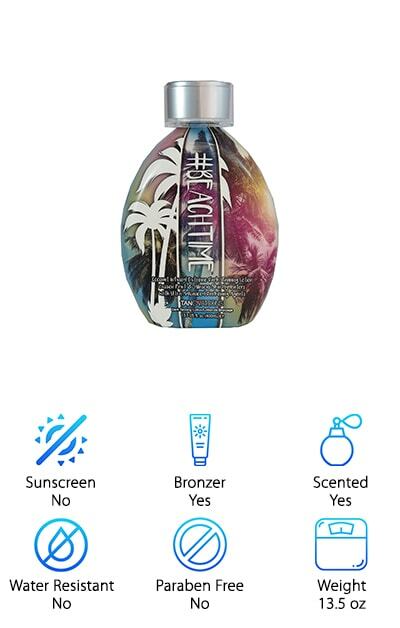 This is also a great choice if you’re looking for an indoor and outdoor tanning lotion. Oh, and one more thing. Its scent is described as “tropical tantini” and, let us just say, it smells absolutely divine. Maybe you’re looking for something to wear outside during more vigorous activities. 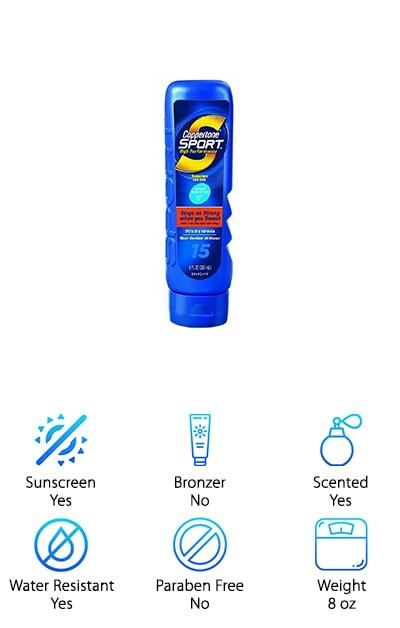 If you’re an athlete and looking for a tanning lotion that’s going to last as long as you do, Coppertone Sport Sunscreen Lotion might be the perfect one for you. It’s sweat proof up to 80 minutes so you can get in a full workout without having to worry about reapplying. That’s not all. It won’t run into your eye or mouth once the sweat starts pouring. How does it manage that? It instantly bonds to your skin on contact. Guess what else. The ultra-dry formula doesn’t leave any greasy residue behind so you’ll still be able to hold your racket, bat, or bicycle handles. It’s also oil-free and hypoallergenic. If you need a serious sunscreen lotion that works as hard as you do, Coppertone is it. There’s a lot of awesome stuff packed into Ed Hardy #Beachtime Tanning Lotion. It’s great for indoor or outdoor tanning and will get you beautiful dark golden results while doing so much more for your skin. For starters, it has coconut milk and oil which are intensely hydrating and soften your skin and help your tan last a little longer. That’s not all. It has seaweed extract to help draw out toxins as well as hibiscus extract to increase elasticity. There’s passion fruit extract, an excellent source of vitamins A and C. We really like the Body Fit feature, which reduces the appearance of cellulite and promotes firmness. Oh, and the Tattoo and Color Fade Protector is pretty awesome, too. It will keep your ink looking bright and help it last.